When the kids start complaining of hunger between meals, they won’t be satisfied with just any stomach-filling snack. They want something delicious and different – and let’s be honest, adults do too. The following snacks are completely healthy, but taste like treats. And, best of all, they won’t take much time out of your busy schedule to prepare. When it comes to snacks on the run, a piece of fruit is the ultimate fast food. But as any parent who’s received an eye-rolling response to the suggestion of “Just eat an apple” knows, fruit on its own can be pretty boring. Instead, try juicing your favourite fruit (and vegetables – this is a great way to sneak some extra vitamins in) and freeze into popsicle moulds. Alternatively, cut up sweet fruits such as pineapple, grapes and watermelon, and freeze. Then munch straight from the freezer, or pop them into a blender and blitz into a frappe. 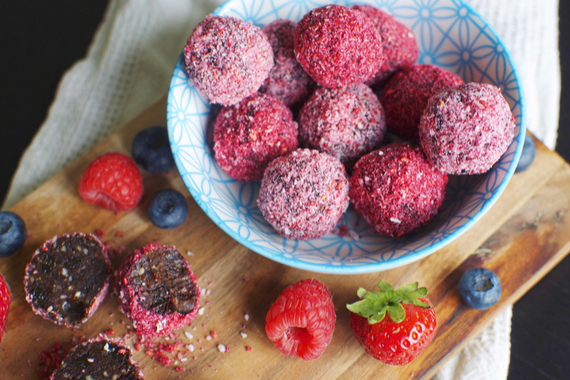 Bliss balls are a fantastic set-and-forget snack food. Make a big batch on the weekend, pop them in the fridge or freezer, and you’ve got a delicious, portable snack on hand for weeks – as long as the kids don’t find the stash! The variations on this high-protein treat are numerous – fruity versions with dried apricots or peaches, nut-free recipes for lunchboxes, vivid green matcha balls – but chocolatey balls are always a winner. Combine 1 cup of almonds or other nuts, 12 medjool dates, 1/3 cup of coconut oil and the same of cocoa powder, ½ cup of desiccated coconut and 2 tablespoons of chia seeds. Blitz in the food processor and roll balls of mixture in coconut or cocoa. Store in the fridge for up to a week – if they last that long. 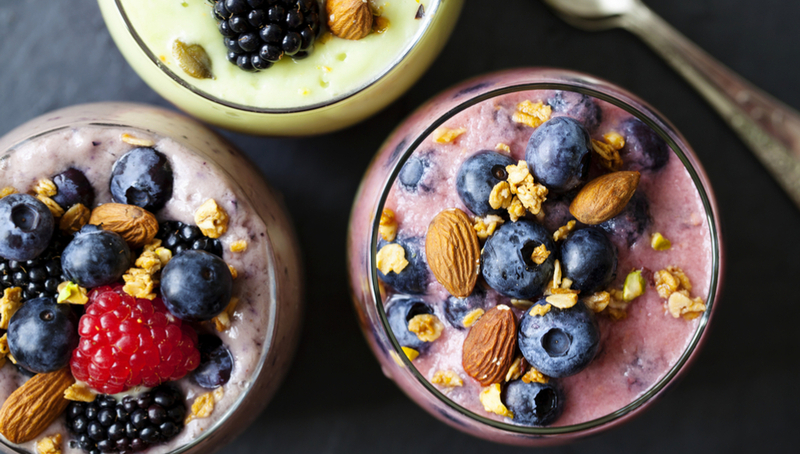 There’s no one way to make a smoothie, which means it’s a great excuse to get creative or use up whatever ingredients you have in the house. It’s also fantastic for slipping some extra nutrients into the kids – or yourself! To a base of fruit and milk or coconut water, add avocado (for healthy fats and a creamy texture), soft-leafed vegies such as baby spinach, or protein-packed pantry staples like oats, quinoa flakes or chia seeds. 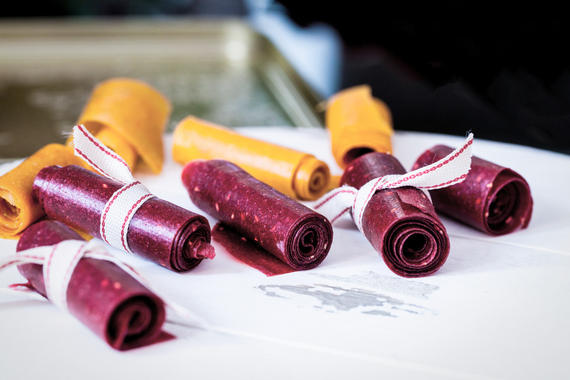 Store-bought fruit leathers are little more than sugar, but making your own is surprisingly easy and turns a vice into a virtuous treat. Cookbook queen Louise Keats’ mango leathers tick the easy and delicious boxes. Puree 2 cups of mango flesh, spread thinly on baking paper or a silicone baking mat, and bake at 80ºC for 3-4 hours. Any fibrous fruits – apples, pears, peaches – should work well. Pack them in kids’ lunches or, for the grown-ups, serve strips on a cheese platter. Enticing the kids to embrace a savoury snack requires some clever marketing. Dips are a great one for this, as kids generally enjoy scooping food and will love choosing between all the different types of crackers and crudités. Simple guacamole or hummus dips are the easiest and mildest-tasting options. For dipping, try vegies such as carrot, celery, zucchini, broccoli, cauliflower and baby mushrooms.